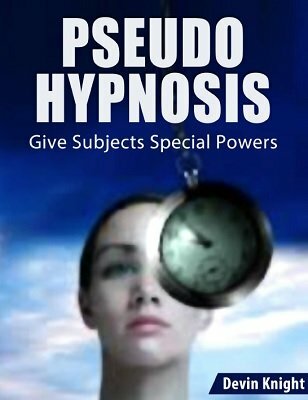 This PDF teaches you how to combine a clever mental effect with REAL hypnosis to create an effect that can't be done with just regular hypnosis. This effect will help you stand out from the competition and increase your bookings. Devin's bookings as a hypnotist have almost doubled since including this feat in his shows. This effect can also be used as an emergency effect when nobody goes into hypnosis. You can do this effect and it will appear to be real hypnosis. Magicians and mentalists can use this as a pseudo hypnotic trick in their shows as it is not necessary to have the person really hypnotized, but if the person is really hypnotized then the effect is much more amazing to the subject! The performer shows four opaque envelopes and says they each contain a different color card. All four envelopes are given to a hypnotized person on stage that has his eyes open. The hypnotist tells the person to mix the envelopes so no one can know which colors are inside. The performer says when he counts to three, that the subject will have x-ray vision for real and will be able to see through the opaque envelopes and tell everyone which color is inside each one. The hypnotized subject will actually see colors insides the envelope while under hypnosis! He hands the hypnotist an envelope and says what color is inside. The hypnotist writes this color on the envelope in FULL VIEW of the audience. Nothing is hidden. The hypnotized subject repeats this with two more of the envelopes with the hypnotist writing the colors in full view on the envelopes. The subject has one envelope left in his hand and the hypnotist asked him to use his x-ray vision to name the color inside. Without touching the envelope, the hypnotist tells the subject to open the envelope and remove the card inside. Much to the amazement of both the subject and the audience, the colored card he removes is the color he just said it was using his x-ray vision! Each envelope is handed back to the subject with the request that he open it and remove the card inside. IN EVERY CASE, THE CARD IS THE SAME COLOR WRITTEN ON THE ENVELOPE. The hypnotized subject, even though hypnotized will be blown away that he was 100% correct. The audience will go crazy with applause as such a thing does not appear possible. This can be done with volunteers in chairs behind you with no chance of exposure. The hypnotist ask the audience if they are convinced the person really has x-ray vision since he was 100% correct, most will nod their heads in agreement. Now the big laughs will follow. The hypnotist says he will give all the volunteers on stage x-ray vision and that everyone on stage can now see through the clothes of everyone in the audience. Hysterical laughter will come forth from the audience, as they will wonder if the people on stage can really see through their clothes. Women will cover their breasts and others will duck down because they think the people on stage really have x-ray vision. One of the funniest bits you can do in a hypnotic show. 1st edition 2015, 16 pages.